So today I have cute card to share. Mario came today from hospital. they put tubes inside his nose and then 3 days he reciving medications through them. if is not ok then they will cut open his nose and fix what is need to be fixed. and then reovering will be much longer. We hope that he will not go on that big surgery. 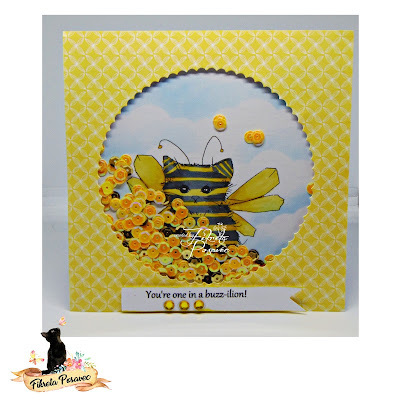 I made kitty bee shaker card. and I wanted to support it. Lil patch of crafty friends challenge 01.06. Word art wednnesday challanage 23.05. So sweet in the lovely sunny colours Fiki. Hope Mario is OK, one of my son's had this done. This is just adorable! Love the cute kitty! Well wishes for Mario. A super card Fiki, lovely rich yellows. Fenomenalna i predivna. Vrlo mi se sviđa. Oh gosh this is cute !!! adorable little kitty bee. So glad he is home and i hope he continues to recover for you. This stamp makes me laugh, how fun is that bee kitty?! Great card.